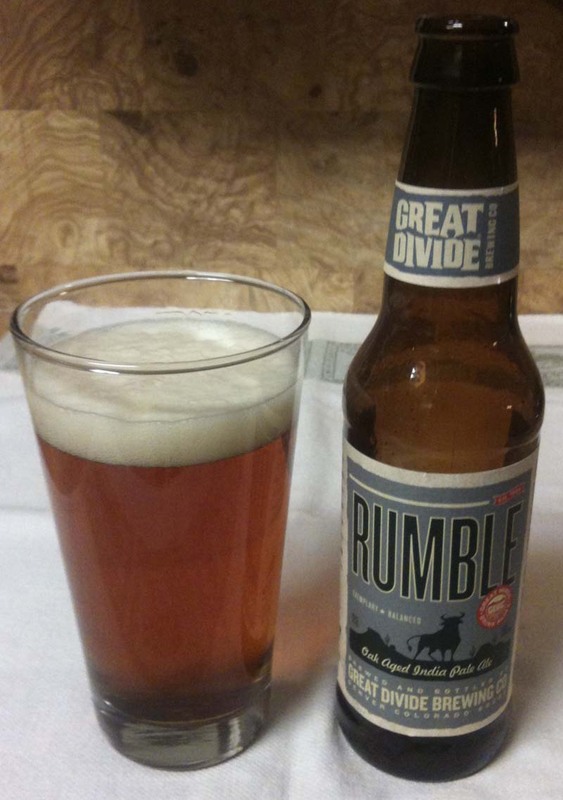 Tonight's beer is a Rumble, Oak Aged India Pale Ale, from Great Divide Brewing Company. The twelve ounce bottle shows 7.1% ABV. Rumble poured with a medium, creamy colored head. Beer color is an amber/copper. The aroma has some mild citrus/pine, but it is mellow and sweet, more like an imperial IPA. Also some honey, caramel. Medium bodied. The oak is present in the taste. The hops are there, and add a bitterness, but the sharp citrus or pine notes seem to be mellowed by the oak. Malt, bread, caramel and vanilla. There is an overall warmth. The aftertaste leaves you with some bitterness and a malty vanilla. A nice mellow IPA, but I prefer a little more citrus in the taste.